In honour of the brave men and women who have served in the Australian Defence Force, The Perth Mint will install a memorial poppy wall at its East Perth heritage premises in the lead up to Anzac Day. From Saturday 6 until Sunday 28 April, members of the public are invited to visit the Mint and place a red poppy on the commemorative wall to help create a poignant community tribute. In support of The Returned & Services League’s (RSL) mission to preserve the memory of military personnel, the Mint has purchased 4,000 silk red poppies from the WA State branch to facilitate this worthy engagement. This year, the poppy wall pays homage to The Perth Mint former staff who served during World War I. Pictured on the wall are nine courageous men, photographed in 1919, who left their families and renounced their civilian duties to defend their country in one of the worst conflicts the world has ever known. RSLWA chief executive officer John McCourt was the first among the crowd to pay his respects. “I am proud to be at The Perth Mint today to place the first poppy on the wall, which pays tribute to the band of original ANZACs and every serviceman and woman who has since followed in their footsteps,” Mr Court continued. 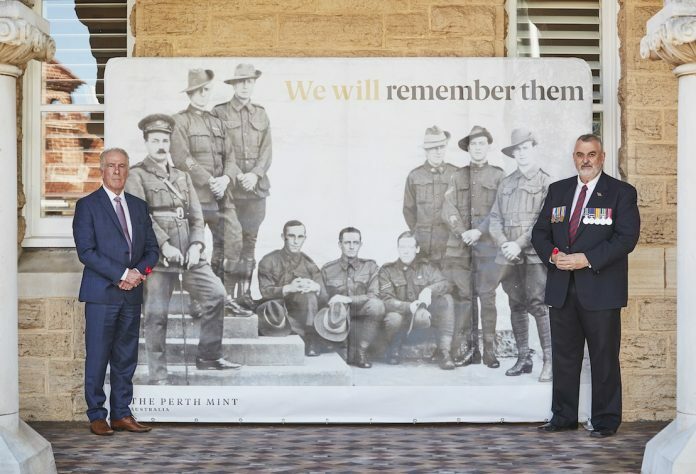 Perth Mint chief executive officer, Richard Hayes, said that with a history dating back to 1899, The Perth Mint, like so many, was also touched by both major conflicts of the 20th century. Last year, The Perth Mint’s inaugural poppy wall commemorated the centenary of the end of the Great War, featuring an unnamed soldier surrounded by thousands of silk red poppies.